Today at VMworld during Herrod keynote we unveiled our EUC strategy and announced the latest release of View: 5.0. Simplify is about fork-lifting EUC assets from the silos they run in today and turning the desktop, all type of applications, and user data into managed services (in YOUR hybrid cloud). This is where View 5.0 play a key role in delivering the desktop as a managed service. Ones these assets have been de-coupled from their back-ends, we can now provide a common management platform that is designed and work across all of them and allows IT to define the policies about who get what, when and with what level of security. In this very heterogeneous new world, management cannot be an after though. It must be be baked in. We can now connect users to their assets across all their devices through the Universal Services broker. We will run the application wherever most efficient and use the native capabilities of each device whenever possible. Earlier this year, we introduced Horizon. 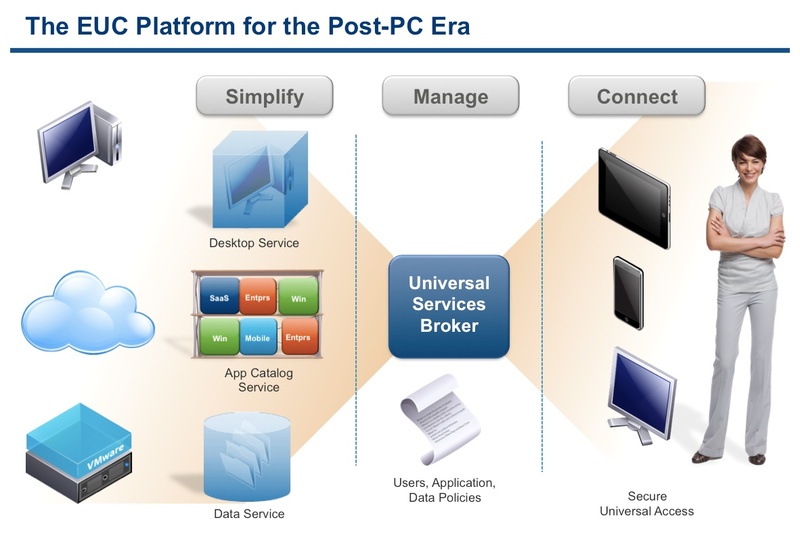 Horizon provides the unified application catalog across SaaS, Enteprise and soon Windows applications but it is also rapidly evolving to become our Universal Services Broker, the core of the management platform for the Post-PC era. AppBlast allows users to access their Windows and Mac applications from any device running an HTML 5 browser. This technology is critical to both unlock existing applications and to connect users to them in a very simple way and without requiring major investment on the server side. Octopus provides secure data synching and sharing for end users across all devices while allowing IT to retain control of corporate data and define data sharing policies. This is the platform that we are building in the End User Computing team at VMware. We are committed to help our customers get to a place where Windows is one of the choices, not the only one. We are building on the great success of View 5.0 and ThinApp but we are also accelerating our investment in the products and technologies we need to free our customer from the Windows-update vicious spiral. I will elaborate more on the pillars of this platform in the coming weeks. See you around at Vmworld 2011!! !